Research shows that companies with a more equal balance of men and women in leadership roles tend to perform better. While women represent nearly 50% of the workforce, the number of women at the top of major corporations remains incredibly low. The ﬁve critical stages in every woman’s career represent the guiding framework that female professionals must identify and address on the path to leadership. This session helps you recognize the turns and learn to navigate obstacles on the path to becoming a high-impact leader. Women are gifted multitaskers who willingly take on more responsibility at work, home, and in the community. However, these production behaviors ultimately hinder a woman’s success. Work leaves them with limited time and attention to develop and sustain the relationships that fuel growth, power, and inﬂuence. Learn to recognize behaviors and principles that paradoxically devalue women in the workplace and inhibit career satisfaction. Participants leave with new mental models and strategies to transform from producer to leader, accelerating the path to empowered leadership. Power doesn’t look good on women. Unfortunate, but true. Women in power often have to choose between being seen as likable but incompetent, or competent but tough or cold. The reality is our culture has long expected that women are kind, and leaders are authoritative. So what’s a female leader to do when she confronts these conﬂicting stereotypes? Get out of the power struggle and step up to another level of leadership actions and behaviors. Paradoxically, leadership is not about you! 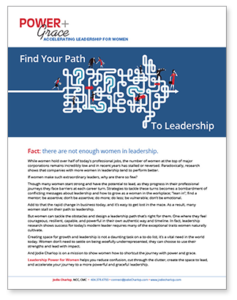 In this session, Jodie brings to life the lose-lose proposition of the male-female continuum and how women can overcome the trap by creating a new level of leadership agility with power and grace. Global research shows that women score higher than men in emotional intelligence. With nearly 40% of a leader’s success directly linked to emotional intelligence, women have a distinct competitive advantage in the area of leadership eﬀectiveness. However, there is one exception — exercising the skill of emotional control (the ability to hold strong emotions and continue to lead forward). This session will help you accelerate your leadership impact by embracing your natural assets related to emotional intelligence and the personal power gained from mastering the art of emotional control. Self Advocacy: Why it’s Bigger Than You!